Somehow Julia knows the alphabet, how to draw all of the letters, and how to make the sounds, etc. THIS IS NOT ANY SORT OF BRAG because: 1. I'm sure children many months (and probably years) younger than she is know all of this and more! and 2. I am 100% positive she learned her letter skillset a la PBS KIDS or maybe Simon is pulling a Tiger Dad and sneak-waking her in the middle of the night to drill her on letters + sounds but it has absolutely nothing to do with me. At all. ... and she claimed that was how to spell, "Sebastian" ... I had to wonder if maybe I need to up my unteacher/unschooling game a notch or thirty five? ... I won't ever stray from my day job folks, worry not. Bwahahaha! So "poop" is short for Sebastian then?!!! I just super LOVE your posts at the end of a long day at work! AAAAAAAAAAAAAhahahaha!!! I love this so, so much :) We get a lot of "CAT" written all over the house by Cecilia, but this is way, way better!!! I was so excited to be the first to comment and then it wouldn't let me... Perhaps dozens have tried and it's just not working, or perhaps my tech-NO is messing with me again. Anyway I wanted to say I love your post! I related 100% the whole way through. My son (2 and a bit) is starting to learn his numbers and it has absolutely nothing to do with me (I'm trying to teach him Arabic and he's learning English) and everything to do with a one Mister Y. Tube. It is helping a little to negate the guilt I feel for his screen-filled days at least, but it's so good to know there are others in the same parenting boat as me! I also have to say the Simon Tiger Dad bit had me cracking up at what a great undercover operation that would be, and Sebastian's floor sleeping fear of normality was just as excellent. Please please keep posting. This.is.the.best. Thankfully it is dry erase!! I mean you have mad bragging rights. Now when another parent says, yes my kid can write their name. You can bust out with, well my child can write words, actual words, one being poop! I mean there has to be a bumper sticker somewhere for this kind of thing! This is hilarious! Of all the things! Just be glad it's the word and not the artist's medium. You haven't lived until you've scrubbed off a Poop Picasso. Oh my Lawd that is funny! And I think that her skills are definitely something to brag about! Letty would recgonize a single letter I would be swooning. ha! it literally (really!) happened overnight. I guess one zillion hours of screen time IS good for something. And I'm pretty sure my eldest is learning the alphabet from Super Why because it isn't coming from me. oh, SAME. Totally blaming (thanking?) Super Why!! I was (sorta) worrying about how my 3yo doesn't know his letters...at all...and my first thought was like: he should watch more TV! POOP! That's great! My daughter used to point at my breast while nursing and says, "poop." I was convinced for a while she was scolding me for offering her crappy milk via I ate crappy food. This is so dang funny. Gotta love those kids. 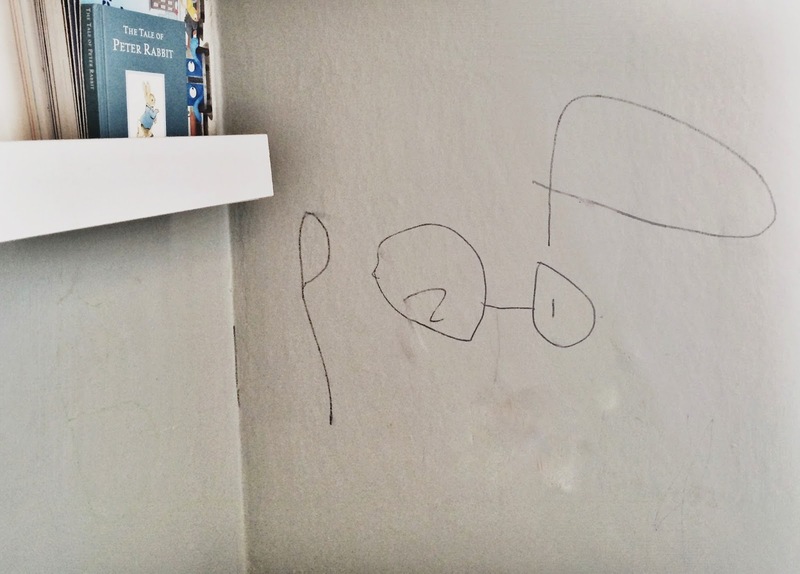 laughing so hard - my daughter did this recently (scribbles, no prodigy letters yet - but they will say poop when she does!) in our new abode - my parents' home :) Rubbing alcohol works great. we are going to need to repaint our entire house before we sell it. luckily, this was dry erase so it wiped right off!!!!! Thank the good Lord above for PBS kids programming. Hilarious! I'm currently pregnant with our first and oh my... I can't wait for these little ridiculous moments. Thank you so much for sharing. Made my day. I recently had a friend post on fb his son's preschool worksheet where he was supposed to write his name. Instead, he wrote "Bob is poop" (Bob is a person they make scenarios about in their family). The teacher erased the second "p" before posting it up for open house. (You can clearly see the p) Sad that the teacher would do that to a child's work. But hilarious still. I am one thousand percent sure my son's alphabet/number knowledge is via Super Why and random youtube videos. Ain't no shame. julia has so many treasures up her sleeve, that girl. This is one of those pictures you pull out on her wedding day. OMG cracking up. She's just SO clever / advanced she's already ragging on her little brother! I love the "1" and the "2" inside the O's. And the connecting line - looks like glasses. Clever girl! Literally chuckled out loud. That's amazing. If only you read the things my kids thing they're spelling. The other day a child wrote, "Kock! Kock! Kock! I heard on the door." No sweetheart, you heard kNock, kNock, kNock on the door. Yikes. I guess it's because all brothers are "poop?" I'm pretty sure she is a genius, and you need to enroll her in the gifted classes. You basically have her submission essay ready to go! Do it!